As Christopher Jones settles into his gig of providing artwork for the ongoing Young Justice monthly series, published by DC Comics and based on the acclaimed animated series, Jones took a few moments of his time to let us in on his artistic style and his approach to working on a comic series. Continue below for more. The World's Finest: To start things off, how long does it take for you to pencil an issue of Young Justice, or any comic you're working on? Does the time differ between working in your own style and when having to adapt to a style? Christopher Jones: The fastest I've drawn a 20 page comic book to date was 12 days. To meet a deadline on my second issue of Young Justice I had to draw 15 pages of it in five days. Those were not five fun days. And that's not a pace I can keep up. It comes at the expense of all other commitments - social and otherwise - and at the expense of sleep. I can comfortably draw a book in 2-3 weeks depending on the style and the content. I did three weeks pretty regularly on The Batman Strikes. I had tried to draw my most recent issue of Young Justice in two weeks to try to bring the book forward in it's schedule, and wasn't able to do it in under three. I blame the recent heat wave, which made my 2nd floor, sun-facing corner studio not the easiest to work in, and the fact that the issue had several pages of Artemis fighting MONQI droids in trees, which made for very detailed pages that weren't quick to draw. I don't know that working in "my own style" or not makes much of a difference. If I'm being asked to draw in a simple, cartoony style that can make things quite a bit faster, actually. But not until I've learned the style enough that I'm not still working to learn it. Young Justice is actually a much more realistic art style than either my Justice League Adventures or The Batman Strikes work. Outside of slightly stylized faces, it's pretty close to what would be a "natural" style for me. WF: For Young Justice, and how integrated the comic is with the source cartoon material, do you privy to episode spoilers? Does knowing what is happening in the show help when getting a script and envisioning how to translate it to the page? CJ:I've had a *few* spoilers about what's coming up in the series because of reference material that's been shared with me (Yes, that IS Wotan in Young Justice #6). I also got to have some conversations with Greg Weisman a few weeks ago, but those were more about what's coming up in the comic than plans for the series. I think the comic is a lot more integrated with the source material than is typical for this kind of tie-in book. And I think that's all due to the involvement of Greg Weisman. From the start I think it was important to him that the comic be an integral part of things, and not that he and Kevin Hopps are scripting the comic, the tone matches the show pretty seamlessly. We're introducing some characters in the comics before they show up on the TV show, and we're getting revelations about the main characters before they they are revealed on the show. And as a big fan of the show, that's all very exciting to me! WF: Looking through back issues of The Batman Strikes, Justice League Adventures, Gargoyles: Bad Guys, and now Young Justice, no matter what style you're asked to adapt to, all of your characters share the same general look (I guess, for lack of better term). They all look like they could exist in the same world, connected. Do you think this is because of the basic similarities to the character designs for all the shows (simplified but with enough details and changes to appear different) make it easy for you to just draw your own way, or that your style is tailored-made for these properties? CJ: I think to any extent that's true it's evidence of what I've said all along - that more of the artist's individual style comes through on a project like this than you'd think, even if the characters are "on model" for the source material. 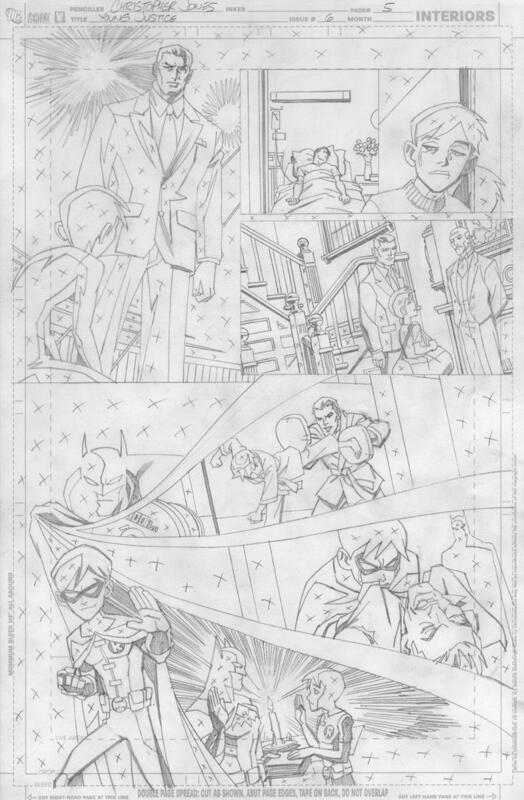 When I started working on The Batman Strikes (based on the animation designs of Jeff Matsuda and his team) after drawing a number of Justice League Adventures stories drawn in the "Bruce Timm" style, a lot of people asked me if it was hard to learn to draw like Jeff Matsuda. And while I knew what they meant (and yes, it took a while to figure out that style), I never drew that book like Jeff Matsuda would have if he'd been the artist on it. A lot of your drawing always shows up in the look of the characters in addition to the storytelling and composition sensibilities you bring to every page of comic art. WF: As a semi-follow-up, your The Super Hero Squad Show artwork is a dead mimic of the cartoon, but completely different than what we usually see of your work. How was it to work on those designs? A challenge? CJ: It was a challenge like it was to learn any other style. The biggest challenge with The Super Hero Squad Show was that I was often being asked to parody an existing classic comic book cover, and the proportions of the characters were so distorted it made it hard to keep the composition close to the original design. WF: Do you follow a certain process when you jump on to work that requires you to adapt yourself to a set style? Is there homework involved, for lack of a better term, and research? Any type of preparation? CJ: Usually you kind of have to hit the ground running. At first you're pretty religiously referencing the model sheets you're (hopefully) provided with. As time goes by it becomes second nature, which not only makes the whole process move faster, but the art becomes more fluid and a more organic blend of your own style and the source material. I feel like I'm a getting there on Young Justice, but given the nature of the stories I've drawn so far (I just finished my fourth issue - #8) I'm more fluent with some characters than others. At this point I know Artemis pretty well! WF: Young Justice producer Greg Weisman and writer Kevin Hopps are joining you beginning with the next issue. How does their approach differ from Franco and Art Balazar? CJ: Well every writer has their own style and sensibility. I know Greg worked very closely with Art and Franco and the series editor to make sure the early issues were in line with plans for the show. Given Greg and Kevin's roles on the TV series itself, the comic now seems to feel like the show on the printed page. WF: To wrap things up, care to give us a preview of what we can expect in the months ahead in the Young Justice comic series? CJ: Well I think I'd have several people cross with me if I revealed too much. I can tell you that the next several stories are all two-parters. Issues 7 & 8 focus on Artemis and her back story. We even get to see her first encounter with the Young Justice team from her perspective. Had you wondered why she shot that arrow through the window during that fight with Amazo and then disappeared? Read the comic and you'll find out! The solicitation is out for #9, so it's no secret that we've got a Captain Atom story coming up. You may know that some of Greg's earliest work in comics was co-writing the Captain Atom series for DC Comics, so that character is near and dear to his heart. The Young Justice story is a murder mystery with espionage overtones and it involves a lot of the old Captain Atom supporting cast. It's told for a Young Justice audience that's new to these characters, but it should be a real treat for any long-time fans. And it's very much a Young Justice story. The team is absolutely in the thick of it all. It's great stuff. After that is a two-parter I haven't seen any scripts for yet, but I'm working on the cover for part one right now. All I can say is that it involves a villain I've badly wanted to draw since my The Batman Strikes days, and never got to. So I'm very excited. The World's Finest would like to thank Christopher Jones for his participation! 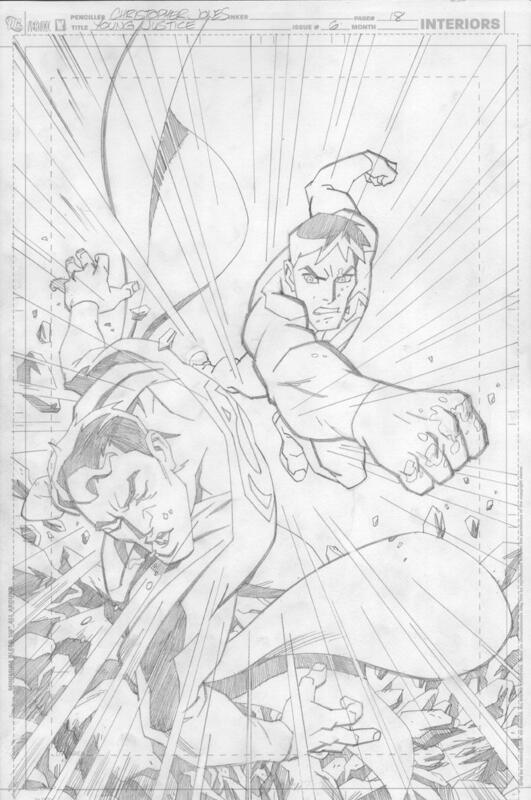 Click here for more comic book production artwork from Christopher Jones. Young Justice is published every month from DC Comics.